Portland is known for its food and drink scene. Breweries are a big hit in the city with 58 local breweries hopping up IPAs, Porters, Ales, Lagers and Stouts. An added bonus are free Portland brewery tours. Many brewery tour companies in Portland charge $50+ for tastings and brewery tours. 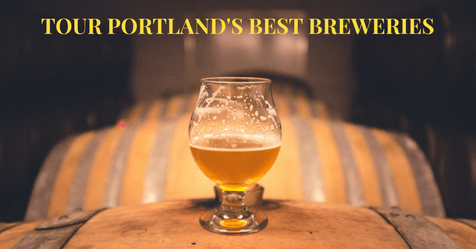 Ditch the company and take a self guided tour at some of Portland’s best breweries. Reminder: Where closed toed shoes for tours. Check to see if reservations are required. HUB. Saturdays at 3 p.m. Includes two free tastings. Ground Breaker. Free tours daily before 5 p.m. Ask your server. Ecliptic Brewing. Tours on Mondays, Tuesdays, and Fridays at 12 p.m.
Portland Brewing Company. Saturdays from 12 to 3 p.m. Includes three tastings. McMenamins Crystal Brewery. Tours given daily at 2 p.m.
McMenamins Fulton Pub. Call to schedule a tour, (503) 246-4363. McMenamins Hillsdale Brewery. Call to schedule a tour, (503) 293-1753. McMenamins Oak Hills Brewery. Call to schedule a tour, (503) 645-0117. Kells Brewery. Email office@kellsbrewpub.com for a tour. Bridgeport Brewing Company. Call to schedule a tour, (503) 241-2515. Widmer Brothers Brewery. Tours will reopen soon. Do you know of more free Portland brewery tours? Tell me in the comments section below.